Agua Fresca translates into "Fresh Water". Agua Frescas are a refreshing and tasty summer treat that mainly involve pureed fruit, sugar, lime and water. So whether you are sitting by the pool or hanging around the house I recommend you try this drink to help cool you down. You can really use any fruit. I am sure that someone else has probably thought of a mint and jalapeño agua fresco, but for making this Mexican drink for the first time with only the ingredients I found in my house I was pretty proud of the ingredients that went into it. Puree all the ingredients together in a blender. If you want to pour the agua fresca through a fine sieve for a smoother, pulp-free mixture. I like the pulp and the bits of mint so I did not put it through a sieve. Chill if desired. To serve- Put 2 tbs of sugar and a pinch of salt onto a plate. Run a lemon around the rim of a glass and but the rim directly into sugar mixture until the rim is covered. 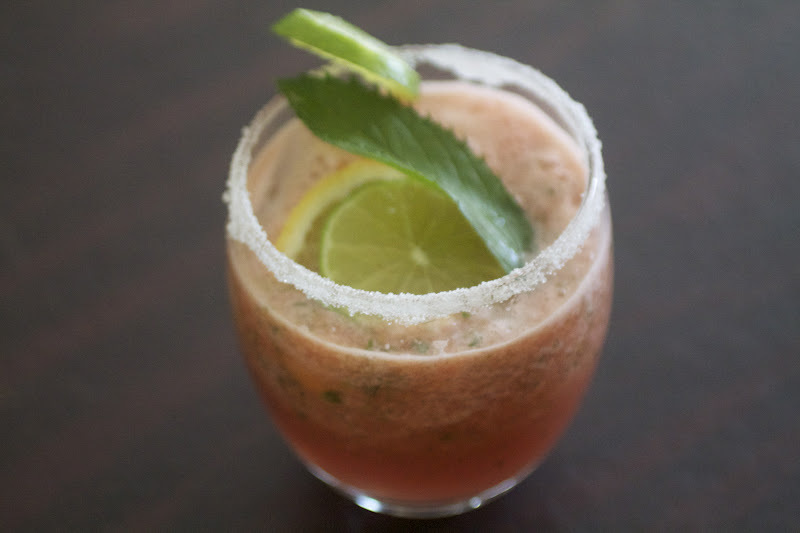 Poor the Agua Fresca into the glass and garnish with slices of lemon, lime and a sprig of mint. This entry was posted in Drinks,Recipe by Catherine Amoriggi. Bookmark the permalink.